Gavin, with his past experience in running large projects (including 6 years international experience in the petrochemical industry), is able to provide a Project Management service to clients. 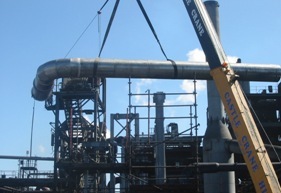 His background in projects enabled him to successfully secure and complete an order for R22Million from Algorax (Pty) Ltd (currently Orion Engineered Carbons) for project management and construction services for the Algorax 2010 Project. This project was run over an 18 month period between January 2008 and July 2009. Gavin was responsible for coordinating a project and construction team of some 35 staff during this time. Gavron Engineering is able to provide a full range of construction services from the conceptual design phase through to facility-commissioning phase. You have a choice when considering many of these services, so why Gavron Engineering? We don't chase every project that comes along. We target those for which we have similar experience, as well as highly qualified and available staff. We may not be the biggest, but we certainly strive to be the very best.